Need more information about booking Home 251100 ? Award Winning Barn Conversion 'Harvest Moon Barn' is a beautifully renovated character barn with old oak beams and 'Villager' wood burning stove set high on Old Blackmoor Hill with fabulous panoramic views. ' Harvest Moon Barn' can be found near the village of Middle Claydon close to the bustling Market town of Buckingham and in close proximity to the National Trust Properties Claydon House, Waddesdon Manor and Stowe - Once Britain’s Best Kept Secret, Bletchley Park is also just a few miles from us - Also not far are the Midsomer Murder villages and places visited by Lewis and Inspector Morse ! .
. 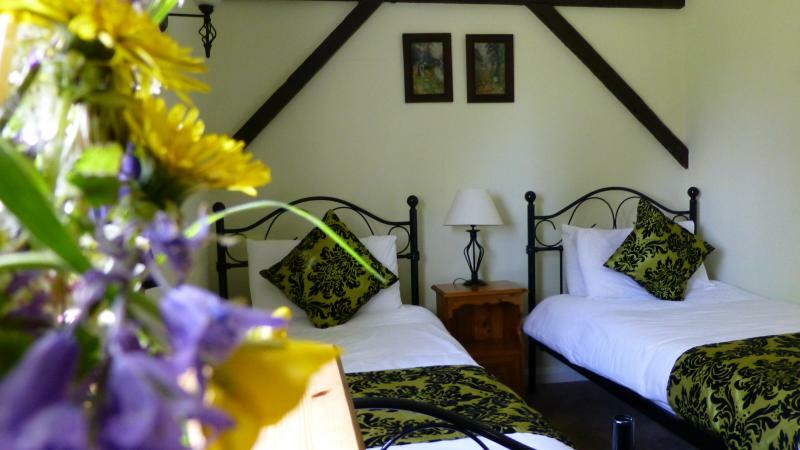 The open plan Self Catering Accommodation sleeps up to 4 people and can be found at the end of a long private drive. The former corn barn is set in a unique wonderful elevated rural location surrounded by open fields, countryside walks and fabulous panoramic views and has unlimited Wi Fi. An abundance of wildlife surrounds us, deer, badgers, rabbits and hares, woodpeckers and red kites are just a few of our regular visitors Harvest Moon Barn has a large private garden overlooking the fields beyond. This Barn has 2 bedrooms, 1 bathroom and sleeps 4. It’s been listed on Holiday Lettings since 24 Jul 2012. Located in Aylesbury Vale, it has 54 reviews with an overall rating of 5. The average weekly rate varies from £642 to £962. The Owner has a response rate of 75% and the property’s calendar was last updated on 10 Apr 2019. You can get in touch with Christine (the owner) through the contact form on this page. Send Christine (the owner) an email through the contact form on this page. Alternatively, if there’s a phone number on this page, you can call them. How do I contact Christine (the owner)? If you’ve already booked, go to Manage your holiday booking to view Christine the owner's contact details or send them a message. Or send Christine (the owner) an enquiry through the Contact the owner/manager form if you’d like a quote or more info first. When you pay online through the Book your stay form, a booking request is sent to Christine (the owner). You’ll find out within 24 hours whether they’ve accepted - no money will leave your account before then. You can also request a quote from Christine (the owner) through the contact form. The owner will email you the total cost for your dates and a link to book and pay online. Use the Book your stay form to pay provisionally online. You can pay by credit/debit card or PayPal. Christine (the owner) will have 24 hours to accept the booking and no money will leave your account before then. Why can't I call Christine (the owner) before booking? You’ll need to contact Christine (the owner) to do this. Send them a message in Manage your holiday booking or through the contact form on this page. You can request to change the dates or number of people on your booking via the Manage your holiday booking page. To change your holiday dates use the Edit booking button. If you need to change the number of guests staying then send Christine (the owner) a message. If Christine (the owner) agrees, they’ll send you a revised quote outlining the changes. You can review and accept/decline this from the Manage your holiday booking page. You’ll have 48 hours to take action before the revised quote expires.